The world of the future is no place of peace. Power rules and the government tries to get the situation again under control in a contest to be the ultimate soldier. As a shooter of other players one is with certainty a candidate for the title. In the single player procedure one is informed by radio at first about rudimentary functions and receives in the later course of the play in this way instructions which do not vary nevertheless very much. The game renounces every kind of puzzle, one cannot open doors and also use no things. Over and over again one is supported by other soldiers, now and then one must protect NPC's. One finds weapons, ammunition, healthpacks and armour. Gore is a pure simple shooter in play, in the kind of Serious Sam, however it can compete neither designwise nor from sound here with that competitor. One selects between 8 game figures and has the usual weapons (pistol, chain saw, MG, shotguns (one with a protection shield on the 2th fire button, one with 4 runs), submachine guns and flamethrowers at your disposal. The surroundings are a bit barren, there are not many details and some texture repetition. For the singleplayer part I needed less than 5 hours to finish it. The multiplayer part disposes of the usual variants for a tactics part. The player's ability to move quickly and jump high is affected by the stamina system. Stamina is usually lost when running or jumping, but being injured by weapons also does a toll on it. How much stamina lost is affected by several factors, such as the player class being used or the weapon currently being held. If a player's stamina goes below zero, he will black out completely and fall to the ground unconscious for a short period of time. You can shoot health packs, fire extinguishers, gas tanks, and ammo boxes which will take out any enemies near them. There is also specific body armor gear such as leg armor, body armor, helmets, etc. that can be targeted with well placed shots causing more damage to unprotected parts. The character is free to climb trees, gutters, and vines. Whoever likes Serious Sam and likes frantic shooting at all costs and uncomplicated, Gore is an alternative if one accepts that this recent product is weaker than Serious Sam though. 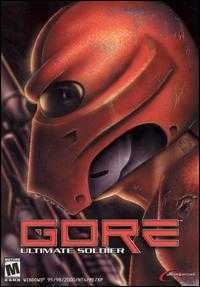 On the 4th of July 2008, Gore: Special Edition was released free to the public and new levels, weapons, graphical and gameplay tweaks, and an automatic patch updater.